A little more than a week ago, the residents of Baldwin County spoke decisively at the ballot box. They said no not only to additional tax increases for the school district, but also no to renewing several millage taxes as well. The final votes weren’t even close for the new taxes, nearly 60/40. That’s not a surprise to me and quite frankly shouldn’t be a surprise to anyone. Almost 85 percent of Baldwin County chose to vote Republican in straight party voting in the 2014 elections. Republican voters don’t like tax increases. 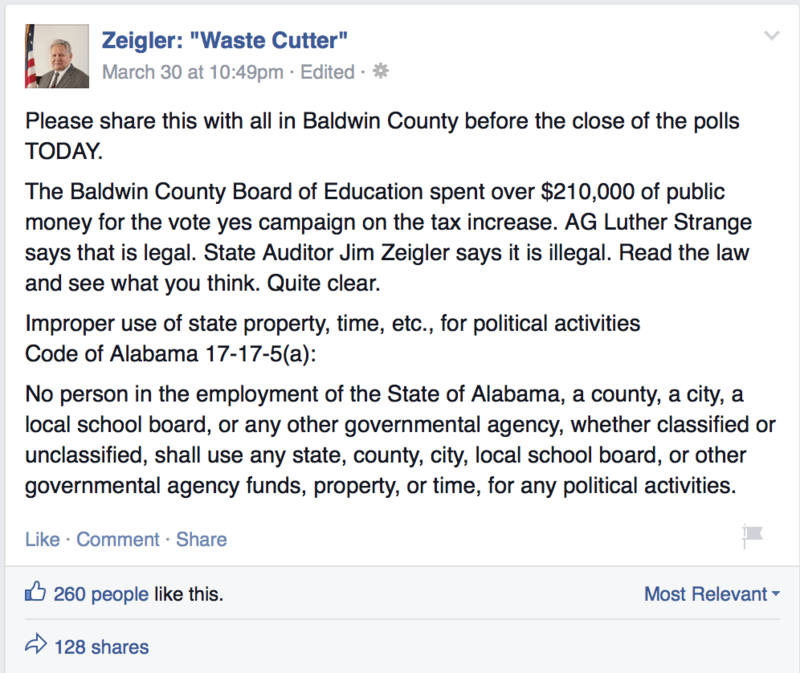 The part of this story that’s noteworthy, as State Auditor Jim Zeigler has pointed out in several press releases and Facebook posts, is the allegedly illegal actions of the school board and school employees. Below is from a statement Zeigler released March 27, 2015. “My office has received four complaints from citizens of Baldwin County that their Board of Education and school employees are using taxpayer money to campaign to vote yes on a tax increase in a March 31 referendum. My preliminary inquiry indicates that the allegations are true and are a clear violation of Code of Alabama Section 17-17-5(a). If true, the activities could constitute a Class A misdemeanor for each offense. I request that you conduct a full investigation of these apparent violations. I request that you present the findings to a grand jury of Baldwin County. Now that sounds pretty straightforward. There’s a law on the books and it’s a pretty good one. Using taxpayer money to ask taxpayers for more money seems more than a little abusive of the tax system. The Attorney General has weighed in and said that a 2003 opinion gives the schools the authority to decide themselves. It seems there is room for debate and something needs to be done to close this loophole if one exists. Bottom line: We need to move forward in whatever ways it takes to end this cycle of waste and abuse.